One of the main factors affecting the health of honeybees is poor nutrition status of the colonies. External feeding in one solution to help preservation of bees health. 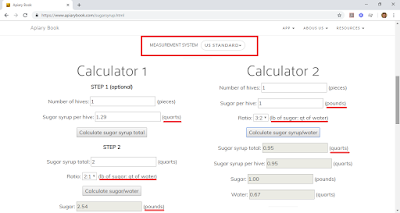 That's way we provide various calculators that helps beekeepers to determine how many liters/quarters of water and kilograms/pounds of sugar must add to get a specific volume of syrup. We listen to the voice of the community and starting today we provide the possibility to choose also US standard as measurement unit. "I just ran across the syrup calculators and was reminded of two things that were keeping me off guard a little. This has to do with units. At least, for those of us who are in the U. S. [...] Similarly with weights and volume. Liters vs. gallons and weights kg vs pounds. There are times when trying to do the conversions in my tired old head, things don't always go as intended." 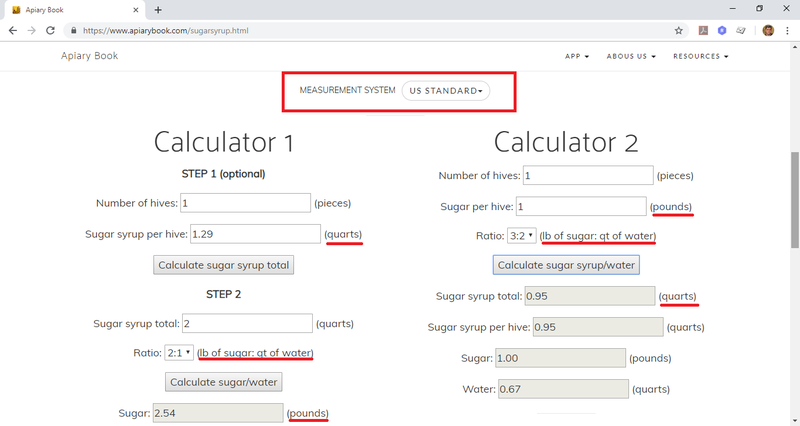 "Make a calculator this in quarts and pounds we buy sugar by the pound in the united states"
Our advice: leave plenty of honey to your bees so you would not need to feed them with sugar!